Wow, the last day of 2016! Happy New Year! And this is also the last day to catch the lights for the season. They will run from 5:30pm until one minute into 2017. Recorded a quick video from last night during the snow and freezing rain. Not the best, but finally got the spiral tree farm into frame. Click on the video above to check it out! Lights are going pretty well so far this year. The added pixel display and blue LEDs seem like they are a hit! The recent rain then hard freeze(around 5F) has taken out a few strands but overall everything is still working pretty good. Traffic has been sporadic but it's been getting pretty busy the past few nights. If too many people "park" on the road or if someone is "parked" in a really bad place we will turn the lights off for a few minutes just to clear things up. To stay current, be sure to follow our Facebooks page for up to the minute rantings and ravings. Lights should be on tomorrow night(the official first night) as long as the weather cooperates. Be sure to keep up with us on the Facebooks for timely updates. Had a good weekend out in the yard with Ms. Sophie. Seems like things are on target for a December 1st start. Keep those fingers crossed! The lighting season wrapped up last night at midnight and today teardown began. In about a week almost all signs of Christmas lights will be gone and the yard will look boring again. God willing the lights will start going back up in about 10 months. Is it bad that I'm already looking forward to that??? Ho, ho, ho... Merry Christmas!!! We'll try running the lights from 6:30pm until 11:00pm-ish tonight(Christmas Night). From 6:30pm until at least 9:00pm we will ONLY BE PLAYING ONE SONG! The traffic got crazy last night so one song will hopefully move people along. Now saying that, the lights will be shut off if traffic becomes an issue! It's only fair to the locals who just get to where they are going(and not look at Christmas lights). Remember, the lights will run until December 31st(New Year's Eve) so there's plenty of time to stop back. And usually by a couple days after Christmas things settle right down and we start playing all the songs again. NO LIGHTS DUE TO RAIN!!! WRAP PRESENTS AND EAT COOKIES!!! Due to family commitments, the lights will be on from 7:00pm to 10:00pm tonight with a RESTRICTED PLAYLIST! Also, the blowups will not be turned on until after 8:30pm. 62F and rain with a chance of thunderstorms! Sorry folks, NO LIGHTS TONIGHT! We will try it again tomorrow! Be sure to follow our Facebooks page for more updates. Unfortunately the rain soaked ground is making it impossible to run the lights. Sorry folks. We will try it again tomorrow! For more timely updates, be sure to follow us on the Facebooks. Setup is going well and everything looks to be on schedule. Be sure to follow us on Facebook to catch all my ramblings about projects, setup progress, and all things Christmas lights! So, even though we expanded and now have a Facebooks page we would like to ask something that's a little backwards from most every other page on there... please, please, please do not share us! Those that have followed the display over the years know why... and now I'll explain it to the newest people here. Our location stinks! Well, not really but as far as being able to park somewhere and watch the lights it does. We can comfortably have four cars in our driveway watching the lights but the road doesn't lend itself very well to "parking". Between the ditches, woodchucks flying over the hill doing way more that the suggested 35MPH(yes, that's actually posted on those nice roadside signs! ), and the fact that we get weather most of Broome County doesn't... sometimes it's almost as much work trying to stop to watch the lights as it is to put them all up! Over the years we have seen people do the dumbest things in order to watch the lights. Parking in the middle of the road with lights off ranks right up there! Please us common sense! If the driveway is full, the uphill side of the road across from the house seems like the best place to get vehicles close to being off the road. The ditch is there, but there is actually a shoulder you can use. Weekday nights seem to be the slowest while weekends seem to pick up. And speaking of picking up... the few days before Christmas are usually insane! We understand why but we also don't? After Christmas it dies right off which becomes the perfect time for getting cozy with the lights(some cars have gotten too cozy... just remember you are on camera when you are in the driveway!). So, there you have it. Don't share us! Keep this whole thing a little secret between us... and you. Watch the lights if you can do it safely. Don't do anything that would jeopardize you, your family, our family, or those woodchucks(for they know not that they are woodchucks). And remember the reason for the season! God Bless! IT DOES NOT LOOK GOOD FOR THE LIGHTS TONIGHT(12/24/2014) due to the extremely wet conditions and possible high winds forecast for this evening. Being high up on the hill here the winds are usually much worse than down in the valley. We will try running the lights after celebrating Christmas Eve with family. Look for the official word after 7pm. The plan tonight(12/23/2014) is the same as last night... ONE SONG will play OVER AND OVER AND OVER again(yes, similar to the Groundhog Day movie). The theory is that hopefully people will stop for the one song and then move on. Things get backed up quick so even though it may look dead... insanity is only moments away! The hours will be from 7:00pm to 10:00pm as long as the heavy rain holds off. p.s. The threat of us changing the one song to "Santa's Elves" if people are really naughty is still there! Please don't make us do it!!! And be sure to follow us on the ol' Facebooks for WAY more updates. I am very guilty of neglecting this page and I apologize to those non-Facebook people. Well... it's really, REALLY wet up here! Not only is it foggy, but there's this thick mist just hovering in the air. Would definitely make for a GREAT Halloween light display! Unfortunately I just tried to run the lights a few minutes ago and multiple GFCI outlets tripped. What this means is unless things get less wet(yes, less wet does not equal dry) we will NOT be able to run the lights tonight! I was going to try and start at 5:30 again tonight but that's not happening. I will try them again in a little bit to see if the GFCI's trip again. Updates will be posted soon but as of right now I only give it a 50-50 chance that they will be on tonight. Sorry folks. The 2014 videos have been posted HERE! Enjoy!!! Things have been going pretty well with the lights so far. The rain that came through the past couple of days wasn't an issue... UNTIL the cold froze all that water in the light sockets. Worked on getting things going for a couple hours tonight before the lights went on but there are still 5 partial sections of arches out, 2 sections of spiral trees out, and at least one section on one of the new 5' trees. Hopefully most of those will be fixed for tomorrow! Be sure to also check our Facebooks page for even more updates! Happy Thanksgiving! We ended up going live tonight around 5:20pm since the family was over and the lights will be on until 11pm tonight. The 2014 lighting season is officially under way! We have been hard at work setting up the display over the past couple weeks. So far the house lights are all up(except the Merry Christmas wire frame) and most of the yard decorations have been placed. There is a *TON* of wiring and testing left to do so hopefully things will be a go for December 1st!!! Be sure to follow us on the ol' Facebooks for more updates. Since I am only posting big updates here, be sure to follow us on Facebook to catch all my ramblings about projects, setup progress and all things Christmas lights! Due to my laziness and the crappy weather heading this way, the lights should be running a couple extra nights(until Friday January 3, 2014). Also, the 2013 videos are now uploaded on Vimeo... ENJOY! Alright... it happened without me even realizing it. I am a Facebooker... there, I said it! I just realized that I update the Facebook page way more than the website now. So with that said, be sure to drink your Ovaltine and be sure to check our Facebook page for updates on cancellations, delays, song rotation, and whatever Jeff is babbling about. Merry Christmas!!! Spent 6 hours out there today putting the blowups up... unfortunately the lights will NOT be on tonight due to the messy roads and forecast snow. We'll try again tomorrow. Lights started early tonight and will be on until 10pm. For more up-to-date updates be sure to swing over to our Facebook page. NO LIGHTS TONIGHT(Thursday 12/05)!!! Due to the ground being saturated, the GFCI protection circuits are going nuts. Looks like crap weather tomorrow also so probably the next time the lights will be on is Saturday evening. Sorry folks. Wow... December!?!?!? Really? How time flies! The weekday hours are now from 7pm to 10pm and the weekend hours are 6:30pm to 11pm. I've been known to start a little early and finish a little late somedays but those are the hours the lights SHOULD be on. Just check here and/or the Facebooks page for updates! Ended up going live with the lights yesterday evening. About the only thing left to do is fix a few(more) strands and put up the banner. So far I've watched the lights for about 3 hours the past two evenings... I like lights! No thanks to the weather... setup is finally almost done! I just need to place the strobes and fix some non-working strands and December 1st looks like a go! It was an absolutely beautiful day out there yesterday... the weather couldn't have been more perfect! 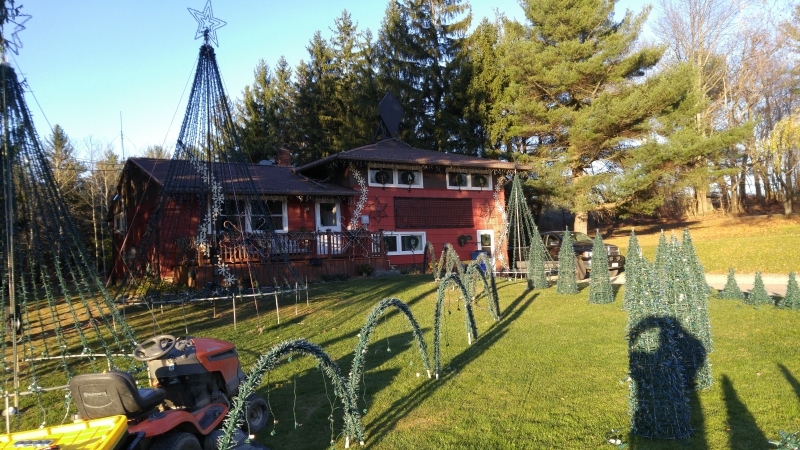 Almost all the yard decorations have been placed and some have even been wired. Almost all the decorations are installed and wired on the front of the house! A couple more little things there then next up will be getting all the lights for the mega-tree tested. Hopefully the tree will go up this weekend if all goes as planned. Roof lights and the Bethlehem Star are up. Having a mental block on testing all the trees though. Sophie and I have been busy testing lights over the past week or so. For more updates feel free to swing over to our Facebook page. 90% of the display is now packed up and put away and hopefully with the warmer weather coming this week the rest can be done by the end of the week. Just wanted to thank everyone who donated to CHOW this year... your generosity was spectacular! One small load of donations made it's way to the middle school with my son and the rest was dropped off down in the Town of Maine. There is one more load that will be dropped off after the wife buys more food with the monetary donations. And due to my laziness... the lights will be on a couple more nights. I went out this morning and started digging them out and I just don't have it in me to take them down yet. Guess I'm getting old. The new plan is to work on taking them down Friday after work so Thursday night will(probably) be the last night to see them. Just uploaded some pictures of all that snow HERE. Man there's a lot of snow! If you do brave the snow to watch the lights tonight or tomorrow(which is the last night), PLEASE be careful on the road and don't block traffic. Thanks. So even though we were in the middle of a good sized snow storm yesterday the lights were on for over an hour and I was recording them. Click 2012 Snowy Videos to see them. We think they are the best videos we've ever posted. Have a see for yourself. Finally, the lights are going off tonight at 9pm due to the roads being slippery. They'll be on again tomorrow. Almost forgot, just like the past four years, the lights will NOT be on tonight, Christmas Night! Please do not plan to come up to watch them. Instead take that time to enjoy your friends and family and give thanks for everything in your life... big and small. God Bless and Merry Christmas! And for those interested, HERE are a bunch of pictures I took this morning with that nice layer of snow that fell. Finally, the 2012 Videos have been posted. In light of previous years being crazy on Christmas Eve we are only playing one song and the "caution" announcement and then that same song and the announcement again(rinse and repeat). We may adjust this depending on traffic but more than likely this will go on the whole night. Please pass the word to not PARK in the street with your lights off blocking traffic! This is a sure way to have the lights "take a break" for the rest of the night. Thanks! The lights are already on! And should be on until 10:30pm tonight too! So let me get this straight... we *finally* fix our moisture problem with lights turning off and now the wind is supposed to kick up to 20-25MPH this evening and up to 50MPH gusts up on the hill here later? Seriously? I mean come on! We're going to play this one by ear tonight... if the lights start whipping around smashing into each other then we're going to have to lower the two largest trees which basically ends the show. And oh yeah, no-can-do on blow ups tonight either due to that wind! Seems like moisture problem is now behind us. I ended up switching the show to a regular show(as in "crazy lights") about an hour ago and everything is still running fine. I really hope we can now run the show in the rain/wet snow because that's what the forecast looks like for the next week. We'll keep our fingers crossed. Well, Sophie and I worked on isolating some of the light trees from the ground(yep, the actual ground) in order to help with the GFCI trips we have when it rains heavily. So far the show has been running for over 30 minutes without a trip. We are only playing seven songs(seven songs that aren't too crazy) and so far so good. I'll update the site if we have to turn everything off. We'll be starting the lights around 6:30pm and they will be on until at least 10:30pm again tonight. The lights will be on until at least 10:30pm tonight. The story of the year(and previous years)... wind is pushing 20-25MPH and it's starting to rain cats and dogs. The show is starting it's shut-down sequence and will be off in about 5 minutes. Welp, I'm trying to run four songs that aren't power hogs... so far so good. There is a possibility of no show tonight due to how wet it is. If it was colder out and this was snow, no problem but with how saturated everything is the GFI outlets will all constantly trip. Let's hope it either dries up or gets cold and snows!!! So... problem #1 earlier was I left the "MUSAC" we play during the day on so people heard both that and the show music. And problem #2 is still going on due to it being soooo wet out there... 3 or 4 GFI circuits are tripping off(as they should). I'm leaving the show on but it's missing 10 to 15 thousand lights. Wow... not sure where the crappy weather came from but due to the road being extremely slippery(one accident happened right down the road from us already) we aren't doing the show tonight. I did start it and then noticed everybody driving by really slow(which is out of the ordinary for East Maine Rd). As anybody who's driven by the past couple of days has noticed... we went live this past weekend. Still have some strands of lights to fix but I'd say the display is at about 98%-99% now. The lights are about 95% up and wired... man I feel old! There are a few more things to work out but everything is looking good for opening night on December 1st. Again, the display hours are now 7pm to 9:30pm during the week due to the "after work" traffic. We will have some of the house lights on before 7pm but there won't be any animated to music. We started the house decorations last weekend and they are just about done now. Hopefully this weekend we will get the megatree lights all tested and maybe even get the tree up! After that the mini-megatree will be next and then all the yard decorations. Sounds funny but that's all the easy stuff... the wiring is last and takes the longest. Being our fifth year I'm sure it'll go quicker, but it's still time consuming. Remember... the display hours are now 7pm to 9:30pm during the week... the "after work" traffic seems to die off after 7pm so that's when we'll be turning the lights on. Started sequencing a couple new songs and I'm going to start working on making the large arch that goes over the driveway a little easier to set up this year. Happy New Year! We hope everyone enjoyed the lights this year. We think we have found show hours that work pretty decent for the road traffic... 7pm to 9:30pm will be the hours again this year(yes, there will be lights again this year) and we are thinking we will only run the display for the month of December... but who knows. Almost all of the yard lights have been packed away and most of the roof lights are also down. This week the house lights will be put away and that will put a wrap on the 2011 display. The lights were on from 7pm to 10pm last night and as long as the rain isn't coming down in buckets this evening they will be on for at least that long tonight. REMEMBER, Saturday night(New Year's Eve) is the last night for the lights until next December. Weather permitting, they will be on from 6:30pm to midnight! Due to the crappy, CRAPPY weather being forecast for the next two days... there is a good possibility the lights will not be coming on until Thrusday night... at the earliest. We may try to put them on tonight since the wind isn't going above 20MPH, but with the HEAVY RAIN they are forecasting the GFCIs will probably all start tripping(meaning the lights go out). Just a heads up that the above video was re-recorded and has much better colors now. I'm going to try and capture all the songs like this before we take the display down. Almost forgot, just like the past three years, the lights will NOT be on Christmas Night! Please do not plan to come up to watch them. Instead take that time to enjoy your friends and family and give thanks for everything in your life... big and small. God Bless and Merry Christmas! Wow... what a busy night! Tons of traffic, but it seemed to move along pretty well. Sorry goes out to the regulars who had to listen to our "caution" announcement every song and also for us repeating songs over and over again. Just trying to keep things moving and not have a re-run of last year. Thanks again to everyone out there tonight(especially those of you who felt the need to yell your approval... the wifey got a kick out of that)!!! If we can keep things moving like this then I can't see a reason NOT to do the show again next year. Heck... I already have ideas for new things next year and the plastic in wallet took a hit today. Thank you again! And if you are telling people about the display... make sure to tell them to check here to make sure there isn't a delay or cancellation and try to spread the "don't block traffic" mantra. Merry Christmas!!! The lights will not be on until after 8:00pm to 8:30pm due to family plans. Merry Christmas. Just wanted to thank almost ALL the people who stopped by last night for not blocking traffic. There were a couple people stopping in the middle of the road and not moving when traffic was trying to get by but for the most part people behaved well. Thank you! No lights tonight due to rain. The GFCIs are going crazy because of all the water. We'll try again tomorrow night. Ok, we/I decided to list some hours above since the cat's out of the bag and we really are having a little show this year. There are approximately 45,000-50,000 lights up and we are hoping to put some blow ups up as well this week(weather permitting). Little favor... PLEASE do not come up to the door and knock or ring the door bell because the lights are not on. If they are not on... they are not on. Again, we are NOT a business where we have hard and fast "hours of operation". This is a hobby for us and the hours listed above are "soft". Have a Merry Christmas and enjoy the lights. Just a reminder that we are NOT having a "show" this year. We *are* putting some lights on in the evenings but the "show" part is only on sporadically, most of the time later in the evening. The kids and I still have the blow-ups to put up but that won't happen for a week or so still. It's just too windy on the hill here to have them up for very long. Put a few lights on the house today... she looks pretty good with some makeup on. Due to a number of issues that have popped up recently(the flood included), we have decided NOT to do a "show" this year. We will probably have a few lights and blowups up, but nothing like the past 3 years. Hopefully if all goes well we will make a comeback in 2012. Just wanted to wish everyone a Happy New Year! Also, new videos are on the 2010 Videos page. And finally, for those who have driven by the past couple of nights and noticed some lights on... this is the layout we are thinking for next year if we do not do a "musical" display. We are going to have the house lights and a couple of the large trees and then blowups and arches in the yard. We're still kicking around ideas so who knows what will happen in the next 10 months. The 2010 light season is officially history. We put the lights on for a couple hours yesterday and from 6:30pm to 10:00pm tonight. We really enjoy the lights and missed having them on. Still not sure what we are going to do next year due to traffic, but we'll post any updates here when we know. There will be some new videos posted this weekend. In case you missed the announcement, the lights have been cancelled for the remainder of the season. WBNG did a story from our house with the stipulation that they didn't mention our address or website or anything that would lead people here... well that failed miserably. People have gone crazy... we've gotten phone calls asking if we're the light house in Maine... the gas station down the hill got hit with loads of people wondering where the light house in Maine is... etc. It's nuts! As of right now, we aren't sure of the displays future. Parking is an issue and some people just don't use common sense(like stopping in the road and then turning their lights off!!!). We love the lights but having people pull into the driveway and sit for 2 or 3 minutes when NO LIGHTS ARE ON is just strange. At any rate, we hope everyone had a Merry Christmas and has a Happy New Year. CHOW update... we collected another bin tonight and the money total is up to $145! The lights will be starting late Christmas Eve. due to family plans. As always, check the website here for when they get turned on. And just like the past two years, the lights will NOT be on Christmas Night! Please do not plan to come up to view them that night... instead, consider taking that time to enjoy your friends and family and give thanks for everything in your life... big and small. God Bless. The lights will be starting a little late tonight due to... well... something. They will be on a bit later than 9pm though to make up for it. The *LIVE VIDEO* feed is now linked in the menu to the left. The lights may start a little late tonight due to family plans. CHOW donations are doing great. We've taken 4 or 5 bins of food down to the food pantry in Maine and so far we are up to $130! We've also gone through ~200 mini candycanes. Thank you all! One note about the money donations... once the lights go dark for the season the wife and kids go to Wegmans and buy food for the pantry. The wife talks to the fine folks in Maine to see what they need most and that is where the money goes... 100% of it. Merry Christmas! The roads are pretty nasty up here so the lights are going to be either delayed or cancelled altogether tonight. Keep an eye out here and I'll post if/when they are turned on. Please spread the word if you can. Thanks. There are some pictures of the blowups *HERE*. The blowups are up! We have to be honest, part of the reason they are up is because people have been stopping in the road even though we ask they don't. So right now, there is a wall of blowups blocking the view. The weather cooperated and the show went on tonight. Also, a few NEW VIDEOS have been posted! WOW!!! There have been some EXTREMELY kind donations this year! The food donations are going along very nicely but the money donations are just unbelievable. THANK YOU ALL for the generosity! The lights should be on tonight from 6pm to at least 10pm. Please do NOT park in the road! Pull into our driveway(and PLEASE pull in so others can also get in) and if there is not room, try stopping back. There is a Christmas tree farm a few hundred feet down the road on the left and then there is a gas station at the bottom of the hill that has Hot Chocolate! 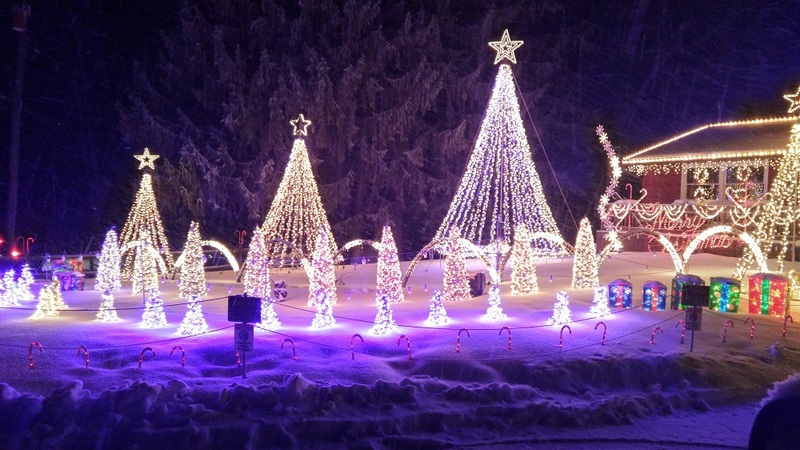 The lights should be back on Saturday... we have a favor to ask of anybody reading this... please be sure to tell anybody you know who might come up to see the lights that they will not be on until Saturday. We have been having people pull into the driveway even though the lights are off. If I'm around(or if I'm watching the security cameras from somewhere offsite) and I see someone in the driveway, I try to play a few songs for them. But with what is happening with our family right now, I'm not really too concerned with the Christmas lights. Thank you. The lights will NOT be on this week due to a family matter. They may be turned on here and there but they won't be left on entire nights. The live feed will return once the lights are back on. God Bless. The lights were about 10 minutes late tonight due to some minor damage caused by... what else... the WIND!!! Let me apologize to the 3 people watching online around 6pm... I got a little frustrated and had a few choice words come out, not realizing the camera was live. If the winds die down and the roads aren't a mess up here on the hill, the lights will go on tonight. I'll give it a 50/50 chance right now. NO LIGHTS TONIGHT due to the heavy rain and high winds. They should be back on tomorrow evening. CHOW donations have been going along at a pretty good clip so far, thank you all! There are still a few more things that are going to be added to the display but I needed a break. Thanks again for the very kind CHOW donations! The display is ~95% up and wired so things are looking good for Thanksgiving night! But, but, BUT... I don't want to sound like I'm replaying last year already... but the weather may be extremely crappy that night. Just a reminder that the display does NOT run during heavy rain, heavy snow, or when the roads are icy. Your best bet is to check out the website if you have any questions. Hit the afterburners the past couple days and most of the yard lights have been placed. In the next week over a mile of cable will be used to connect everything up. Took advantage of the decent weather lately and got a jump on the house lights. Still lots of stuff to test and get ready for Thanksgiving. Things will really be picking up after Halloween. The daughter and I have been testing and rebuilding some of the trees this past week. We had a little accident in the storage shed and two of the 5' trees were crushed under storage tubs... a little welding... a little sticky tape... and they are good as new. Started testing some lights this past week, next up will be some touch up painting. All the display items in the yard have been broken down and the lights have been packed away. And yes... it was COLD and WINDY the past three days!!! The house decorations are next and will be taken down and put away over the next week. Thanks again for making 2009 a great year! Another year of lights is history. Last night was the last night for the lights until Thursday, November 25th when we start it all over again. Plans are already being put to paper and two new songs are already being worked on. We hope you all enjoyed the lights as much as we did and thank you to all those who donated to CHOW! Happy New Year's Eve!!! The lights will be on until midnight tonight and 10:00pm on New Year's Day. The lights will probably NOT be on tonight! If they do get turned on, it won't be until after 8:00pm. The lights will be on until midnight on New Year's Eve and 10:00pm on New Year's Day. Tonight is NOT looking good for the lights due to the high wind. Anytime the wind is over 20-25MPH we have to lower the two large trees because the wind smashes the lights into each other which breaks them. We may try to run the show without those trees tonight though since it's getting so close to the end of the season. The lights will be on at 5pm tonight. Reminder... Friday January 1st will be the last night for the lights until next Thanksgiving! No show tonight due to the rain and wind. I had it running for about 20 minutes earlier but the GFI outlets turned off due to the moisture. Tomorrow evening is looking like a winner weatherwise so the lights will go on early! Michele's Mother has made it through the surgery and is doing well. Thank you for your Prayers! The lights will not be turned on until after 6:30pm on Christmas Eve but they will be on until at least 10:00pm. And just in case you missed it in the "Schedule" section, the lights will NOT be on Christmas Night! Please do not plan to come up to view them that night... instead, consider taking that time to enjoy your friends and family and give thanks for everything in your life... big and small. God Bless. The lights were delayed until about 6:50pm due to a system issue. Surprisingly there were two people parked out front in the dark waiting for them! Remember... FEEL FREE TO PULL INTO OUR DRIVEWAY! We really don't mind and more than likely you will get a candy cane to enjoy while watching the lights! CHOW UPDATE: CHOW donations have been steady this year and we have been dropping them off weekly down in the Town of Maine. THANK YOU ALL for the very generous donations! These donations and seeing the happiness on people's faces as they watch the lights are two of the big reasons we like doing this whole display. Thank you! On a little less positive note, we would just like to remind a couple people that this light display is a hobby for us and NOT, I repeat, NOT some kind of business. The hours listed for when the lights are on are only a rough guide as to when they are normally on. If we decide to go out for dinner one evening and the lights don't get turned on "on time" then so be it. 99.8% of people understand this and don't need to be told, but there have been a couple emails that have made us chuckle because they are written in the style of a complaint towards a business... which we are definitely NOT! The videos of this year's display are now online HERE. The lights will be on at 5:30pm tonight and Brownie Troop 727 will be in the house and possibly outside the house handing out candy canes!!! Due to the rain and freezing rain, we are assuming the lights will NOT be on tonight. If it should happen to get a little warmer and change over to all rain we may put the lights on but it's not looking promising. OOOOooooo Doggie is it cold and windy out there! The lights ARE ON for now but the wind is really whipping. Supposedly it is supposed to start dying down after 6pm so we're going to try and keep everything together until then! We're going to try and get the lights going tonight but the wind is still pretty gusty. The lights should be on at 5:00pm and hopefully they will be on until 10:00pm(depending on the wind). NO LIGHTS TONIGHT!!! Due the the continued windy conditions up here on the hill(gusts to over 40MPH), the lights will not be on tonight. They will be on this weekend from 5:00pm to 10:00pm as long as this wind dies down to under 20-25MPH. The wind that came through with last night's storm wreaked havoc with the two large trees. They were lowered this morning but there are multiple broken strands. They are back up now and we're going to give it a go tonight but if the wind picks back up and starts breaking strands of lights again, we'll have to stop it. Thankfully it looks like only a day or two of these winds and then it will be back to "normal" upstate NY December weather. There are some new pictures of our display HERE. We are going to try putting the lights on at 5:30pm tonight and see how it goes. One big reason we do not usually start until 6:30pm on weekdays is because of the "going home from work" traffic... we'll see how it goes. The lights went on at 5:00pm and will be on until 9:30pm tonight! The lights did not go on tonight due to a delay in us getting home and then the roads being pretty slippery up here on the hill. We are planning to turn the lights on at 5pm tomorrow evening to try and make up for tonight. BUT, you never can tell what the weather on the hill will be like so who knows! 95% of setup is complete so it's looking like things are a go for tomorrow evening. Put most of the items out in the yard this weekend... now to wire them all up with over a mile of cable! Made some good progress this past week working on the house lights. The above picture shows how far along we are. We are hoping to wrap up the house this morning and start work on the 21' tree this afternoon. And thanks to the wifey working with the local CHOW chapter, we will be collecting CHOW donations for people right here in Maine. Took advantage of the beautiful weather today and started putting up the lights on the roof. They should all be placed and wired this afternoon and then I'll test for burned out lights tonight... one project down... 108 more to go! We haven't started putting anything out in the yard yet but we have started to test all the lights! This year will be similar, but different. We are adding 15,000 to 20,000 more lights so it should be an even brighter year! All the lights in the yard are put away and so is the star that was atop the house. In the next few weeks all the house decorations will be put away and then the 2008 season will officially be done for us. Again, thanks for everyone stopping by and a big THANK YOU to those donating food/money for CHOW! UPDATE: Saturday 01/03/2009 The Final Day! HAPPY NEW YEAR!!! The lights will be on until 10:00pm tonight and then not again until Thursday November 26th at 5:30pm... which is Thankgiving. This is the final night and we would like to thank everyone who has stopped by... it has been a blast. We took a few pictures of the display during the day today, CLICK HERE to view them. HAPPY NEW YEAR!!! The lights will be on until 9:30pm tonight and 10:00pm Friday and Saturday. The lights will NOT be on Tuesday or Wednesday nights. The wind that came through last night twisted our 10 foot, 3,600 light tree into a pretzel and the wind is supposed to keep up for some time. We are hopeful to be up for the final three nights, Jan 1st thru Jan 3rd. The show is up and running. We would like to thank everyone who has stopped by. Seeing how happy people are watching the lights is just awesome. We have also received a lot of email with some being very emotional. We are humbled by what people have said and we are honored that we can bring some cheer into people's lives. We had a feeling people would like the lights, but we did NOT expect people to be so moved by them. We have received Christmas cards and monetary donations through the mail... which once again has just shocked us. So... we would like to THANK EVERYONE again and wish you all a MERRY CHRISTMAS! Click HERE for the written story. We just want to remind you that if you are stopping by, PLEASE DO NOT STOP IN THE ROAD! Just park in our driveway and if there isn't room, try stopping back later. AND USE CAUTION ON THE SHOULDER OF THE ROAD, THERE IS A DITCH UNDER THE SNOW!!! It may look like solid ground over there, but it isn't! Finally, THANK YOU for all the CHOW donations! We have had OVER THREE FULL tubs of food and are very grateful to all those donating! Merry Christmas! We are located at 1245 East Maine Rd in the Town of Maine(in NY). 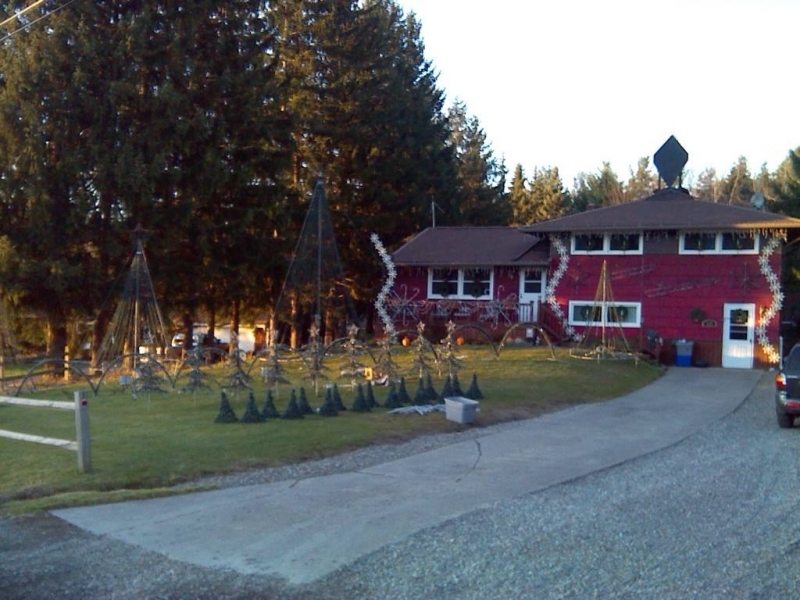 We have always enjoyed decorating the house for Christmas and in 2007 we had a display with about 4,000 Christmas lights and 13 inflatable. 2008 is the first year that we are having the display synchronized to music broadcast on 94.9 FM radio via a low-powered FM transmitter. There are around 45,000 computer controlled lights with Silver, Gold, and Red being the main colors. The inspiration for the display is Richard Holdman of Utah. Our whole family has enjoyed his display for the past two years and our display tries to capture his style of lighting(and boy does he have style!). Some items of interest for 2008 are a 21 foot Mega-Tree with 4,800 lights, a 10 foot tree with 3,600 lights, sixteen 2 foot Mini-Trees with 300 lights each, four 10 foot animated arches with 1,700 dancing lights each, nine 5 foot trees now with 1,500 lights each and a 12 foot tree with 4,800 lights. The show lasts 15-18 minutes start to finish so be sure to allow enough time to enjoy it. And if you are stopping to enjoy the lights, we ask that you remember East Maine Road can be a very busy road at times and completely dead at others. The suggested speed limit is 35MPH over the crest of the hill(thanks Judge! ) but people do not seem to follow that suggestion. Please feel free to pull into our driveway to enjoy the show! Two cars can pull side-by-side and if you go in far enough another two can pull in behind you. PLEASE TAKE NOTICE: We cannot have people parked in the road, if this happens the show will have to be stopped. Unfortunately some people travel well over the cautionary speed limit of 35MPH on the downhill side of our road so... DO NOT STOP THERE!!! PLEASE PULL INTO OUR DRIVEWAY and if there is not room, please consider stopping by later. If you have tried a few times and just can't get in, send us an email and we be sure to get you in.